Before trying Excelerol I was pretty much skeptical about all the benefits it claims to bring to your brains and body. I considered it as another energy booster supplement. After taking it for few weeks I can tell you that it is one of the best brain products I ever tried. 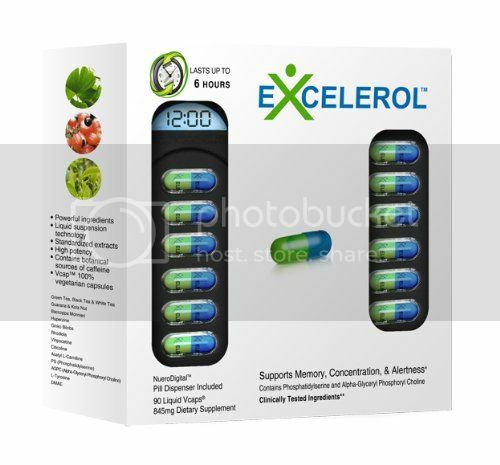 Being 100% vegetarian Excelerol capsules help to improve your memory, concentration and alertness. No matter if you work on a special project or need to concentrate on certain subjects, Excelerol is here to help. This non-precription supplement has citicoline and phosphatidylserine as its ingredients. Excelerol helps your brain work effectively and follow your intentions to focus on something important or need more attention. I found Excelerol effective in two situations, first one when I need to concentrate on certain work projects which need all your attention and creativity and, second one when I need to take care of kids and seniors which require much focus and alertness, especially when we are driving a car, playing outside or travelling. The pills tastes like mint and do not irritate my stomach which is great for overall health. I also like it is not addictive and I can stop and start using it when I need it. Though the price of Excelerol is not very cheap, around CAD $150.00 I think that it is worth every penny. Plus it often comes on sale and the company offers bonus packs.